Topsail Island NC is a great place to get married! Perform the wedding ceremony on the white sandy beaches of Topsail and then have the reception at one of the island's great facilities. Rent vacation rental homes from Ward Realty to accommodate your family. Members of our staff have been married on the island and they would not change a thing! The choice is yours and the opportunities are plentiful. Make it a time to remember forever! Not only are weddings a great thing to have on Topsail NC, but other special events can be performed as well. One thing that is very special to us are the homecoming celebrations for our heroes overseas. Camp Lejeune (Jacksonville NC) is only 30 minutes away and Fort Bragg (Fayetteville NC) is about 2 hours away. 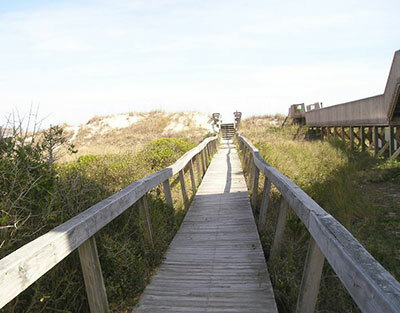 Topsail Island is the perfect place for families to welcome home these men and women who deservingly need a vacation. Ward Realty is proud to help provide accommodations to those who have sacrificed so much. Below, we have provided many vendors for your wedding or special event for you to contact. If you need recommendations we will be happy to assist you. For a more complete list of information, please visit the Topsail Island Chamber of Commerce.